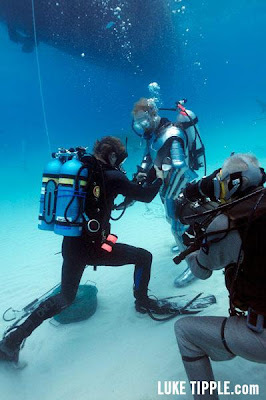 Shark Diver : Shark Diving : Swimming With Sharks: Why shoot productions with sharks at Tiger Beach, Bahamas? Why shoot productions with sharks at Tiger Beach, Bahamas? Film and television productions have come to realize that Tiger Beach, Bahamas is perhaps one of the best sites to film shark productions on the planet, and for good reason. Shark Diver has been involved with top rated productions for the past seven years at this unique dive site and we have listed just a few reasons to consider your next shark productions here. Tiger Beach sits just off the shores of Grand Bahama Island. With top rated hotels for talent and crews like the Old Bahama Bay Resort and Marina as your base of operations and medium sized dive vessels for productions, from concept to shoot day this site has everything you will need. Additionally the Bahamas Film Commission is perhaps one of the most production friendly government agencies in the Bahamas and has gone to great lengths for every production they service to make things happen. Few dive sites on the planet can offer guaranteed big animal encounters with Tigers, and even fewer offer multi-species encounters all within a short distance of each other. From Reef sharks to Tigers and even clouds of Lemon sharks, Tiger Beach and the surrounding reefs offer shark filled productions in short order. At a maximum depth of 20 feet Tiger Beach offers an encounter space tailored for novice to serious talent. Visibility at Tiger Beach is 80% blue water, additionally the vast majority of Tiger Beach is white sand bottom allowing for additional objects and production development for larger commercials and product placement. Consider Tiger Beach a blank canvass for commercial productions that seek live sharks in the environmentally friendly environment they develop. Most shark productions originate out of the USA. From commercials to documentaries flights, accommodations, and time are of the essence once you decide to do a shark production. With ease of travel to Freeport, Grand Bahama from multiple major airports in Florida the Bahamas makes the most production sense. We like to call this site a one-stop-shop for unique productions. In 2010 Shark Diver was the driving force behind an award winning Gillette commercial at Tiger Beach, developing the site, building cage systems, talent choices and dive safety crews. In tandem with a top Los Angeles based commercial agency the following Gillette commercial set the bar for live action shark filmmaking and won a prestigious award at the Cannes Film Festival. Where are you going to shoot your next shark production? White Sharks vs Snappers - Great Video!